Wedding Day – 117 C Street S.E. Last night we celebrated our parents, Frank and Norma Boling’s, 70th Wedding Anniversary and all family that possibly could meet up did so at their home of nearly 60 years. You see, my parents were 17 and 18 when they eloped to Ellicott City, MD, and were married by a justice of the peace. There was not any formal celebration because at that time, my mother’s family didn’t really like my dad. Mostly, I think, because they thought he was Italian??? Go figure, the ethnicity stigmas of those days that unfortunately still exist in our culture today! Well, here we are 70 years later, three children, nine grand children, 10 great grandchildren, and 4 great-great grandchildren with yet another on the way! For the most part Frank and Norma grew up together had many happy years and memories; and according to mom yesterday, some were not so happy as others, but they were just part of everyone’s life’s path and commitment to each other. February is the month for lovers and hopeless romantics like me who believe in love at first sight, true and everlasting love, and fairy tale stories–all ending with; “and they lived happily ever after”. 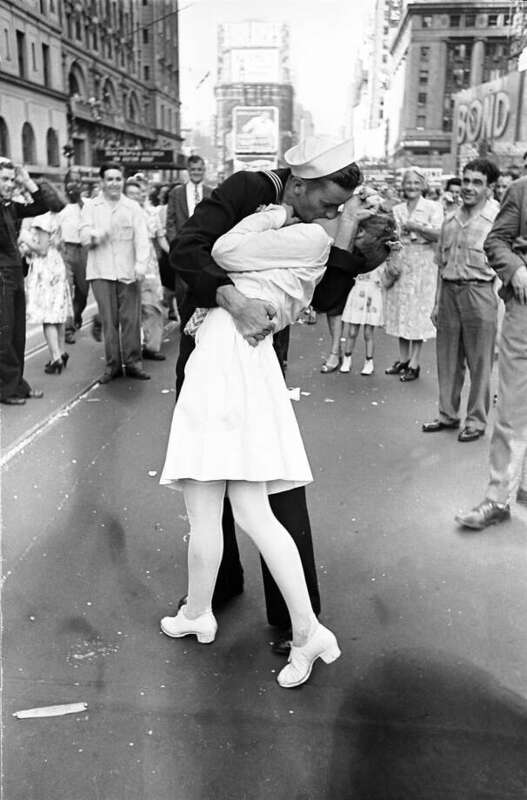 I believe Alfred Eisenstaedt (1898-1995), the photographer of the now infamous World War II Times Square photo, must also have shared my hopeless romantic sentiments, at least at the time he captured the sailor and the nurse kissing.